With and Without SolaTrim Barrier. SolaTrim was engineered to allow for air exchange under the solar panel array, keeping the system ventilated while blocking pest intrusion. As part of SolaTrim’s product testing, we measured the effect that installation of SolaTrim had on backside module temperatures. To document the effect, we placed temperature sensors near the bottom of the system outside the perimeter and at the top portion of the array underneath the module (see photo). We charted the sensor readings for 3.25 hours, on a partly cloudy day, wind 5-7mph, in the temperate climate of the East Bay hills in the SF Bay Area, Northern California. 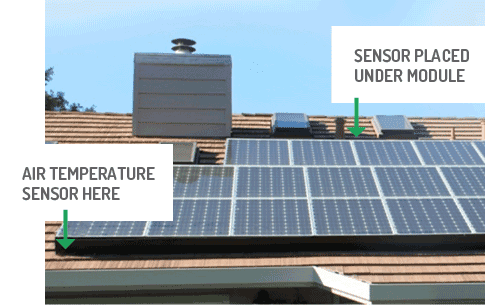 As the results shown here indicate, the temperature differential between the two measured areas demonstrate that under these conditions there is no significant warming effect, and air exchange is possible when the solar array perimeter is wrapped with SolaTrim’s Pest Abatement Barrier.